Adding an underlayment under your hardwood can serve many purposes. When choosing hardwood flooring, many homeowners only focus on the wood itself. While that is certainly an extremely important part, that’s not the only factor to be considered. An underlayment is a thin layer that goes in between the planks of hardwood and the subflooring, whether it’s concrete or plywood. It is installed before the new flooring is laid down. Underlayment can be used with either engineered or solid hardwood. Adding an underlayment under your hardwood can serve many purposes. Whether your home’s subflooring is plywood or concrete, it isn’t always an ideal foundation for your gorgeous new floors. This is where the underlayment comes in. Putting down an underlayment creates a nice smooth, flat foundation so that when the hardwood is installed it can have a great place to stay for years to come. The underlayment also acts as a bit of a cushion. It adds a nice little spring to the wood. This is a major bonus when you’re throwing a huge holiday dinner party and you’re on your feet for hours on end! One of the biggest arguments people have against hardwood flooring is that it can be noisy. While it won’t entirely eliminate this issue, an underlayment can significantly reduce the amount of creaking from your floors. It’s great for those creaky stairs! 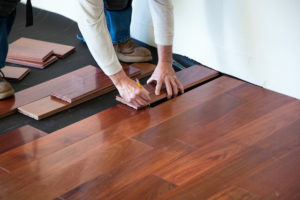 In the cooler months of fall and winter, your underlayment will keep your hardwood from getting super cold. This is especially helpful if the hardwood is just on top of a concrete slab. That concrete will get good and cold, and without a barrier in between that cold will go right through to the wood. The underlayment acts as an insulator, keeping your hardwood from getting too cold. This entry was posted on Friday, May 25th, 2018 at 11:38 am. Both comments and pings are currently closed.